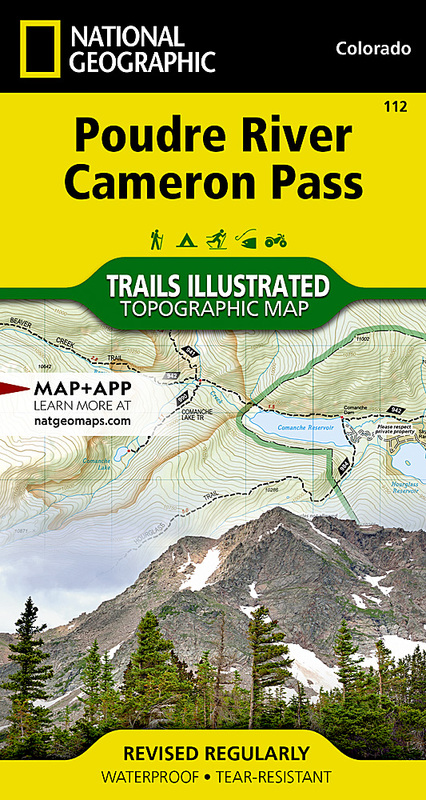 Outdoor enthusiasts looking to enjoy the pristine areas in southern Roosevelt National Park will find National Geographic's Trails Illustrated map of Poudre River and Cameron Pass an essential travel companion. Expertly researched and created in partnership with the U.S. Forest Service, Colorado State Parks, the Bureau of Land Management and others, this map will guide you along the trails, over the peaks and across the rivers as you enjoy your adventure or recreation activity. Included in this map are the areas of Comanche Peaks and Rawah Wilderness, Bull Mountain, Bliss State Wildlife Area and more. The map's clearly marked trails, tagged with mileages between intersections and colored according to their permitted usage, can guide you off the beaten path and back again. The map base includes contour lines and elevations for summits, passes, lakes and rivers. The Cache la Poudre North Park Scenic Byway is also mapped out for those who prefer to explore the area on the road. Some of the many recreation features highlighted on the map include: campgrounds, huts and yurts, wildlife viewing areas, cross-country ski, snowmobile, ATV and bike routes and visitor centers. Due to the extreme weather here in the winter, the map also includes seasonal safety warnings, so visitors know what areas are closed during certain parts of the year. Other features found on this map include: Comanche Peak Wilderness, Mummy Range, Neota Wilderness, Rawah Wilderness, Rocky Mountain National Park, Roosevelt National Forest, Routt National Forest.